Below is a gallery of some of Currier & Ives‘ classic prints featuring horses. Founder Nathaniel Currier had a passion for racehorses, so it’s not surprising that horses were often celebrated in the company’s artwork. Nathaniel Currier started his art print business in 1834 when he and a business partner purchased an existing lithography shop. James M. Ives joined the business as a bookkeeper in 1852, the beginning of a successful era for the firm that continued for another 30 years. The business was renamed “Currier & Ives” in 1857. 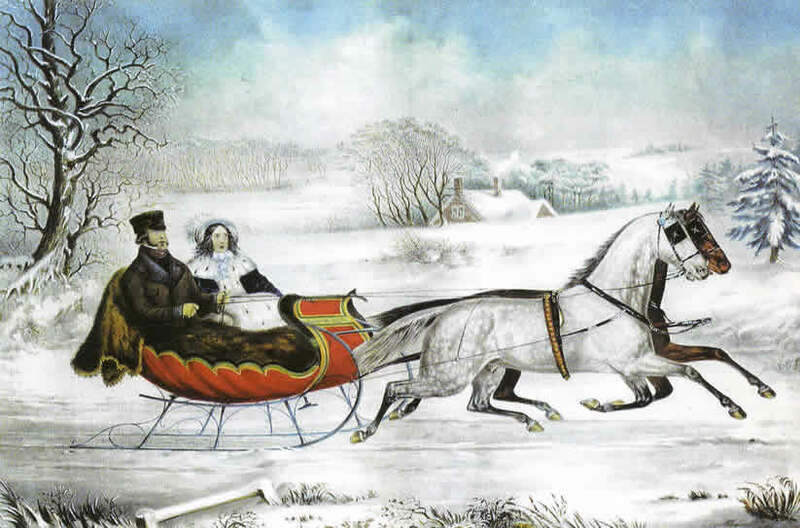 Winter scenes and horse racing portraits weren’t the only subject matter for Currier & Ives. 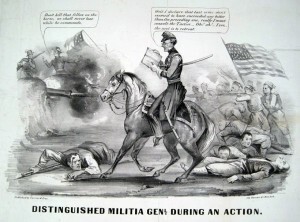 The company produced political cartoons as well, such as the one featured above that lambasts a Union volunteer militia officer during the Civil War. In it, the general consults a tactical guide as his troops are dying around him and a Confederate officer insists that if his troops allow the Union general to live, the South is sure to win the war. 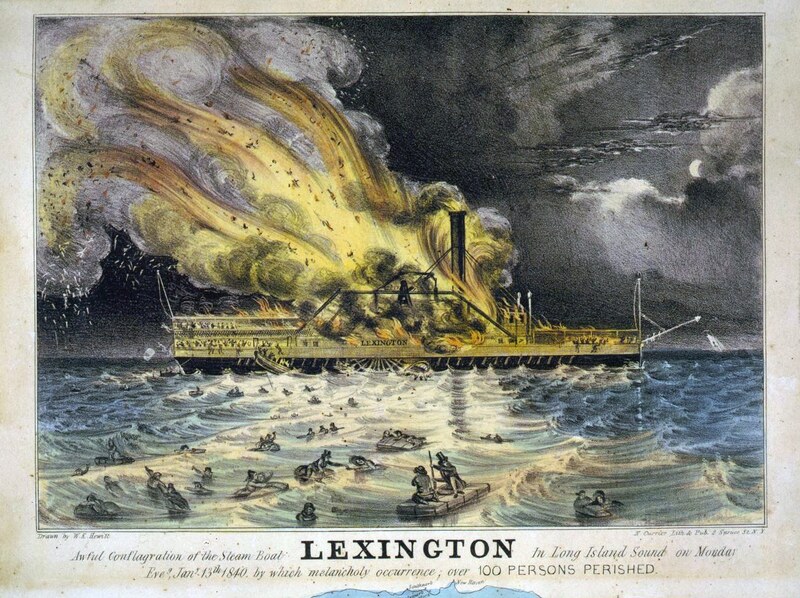 Currier & Ives first gained success by printing illustrations of historical events, such as Awful Conflagration of the Steamboat Lexington, which portrayed the tragic burning and sinking of the paddle steamer Lexington in 1840. It was a shocking disaster, as there were only 4 survivors of the 143 passengers aboard. All three lifeboats were destroyed during attempts to launch them and the water was so cold that many people died of hypothermia after jumping overboard. Because there were no photographs of the event, Americans were eager to see an artist’s rendition of it and Currier & Ives sold thousands of Lexington prints. It also revolutionized how news was delivered as newpapers began attracting more readers by featuring images with their late-breaking stories. Currier & Ives prints were produced using lithography, which replaced the more time-consuming method of engraving images. In lithography, a large stone is ground to a flat surface and a mirror image is painted on the stone with a grease pencil. Gum arabic is wiped over the stone, which is repelled by the greasy ink and attract water. Then turpentine is wiped over the stone to remove all but a ghostly image — the image has been bonded to the stone. A damp sponge is wiped over the stone and the moisture is repelled by the greasy ink. Oil-based ink is applied to the stone, which is attracted only to the greasy ink, leaving the wet areas of the stone blank. The stone is placed on a press, a piece of paper on top of it, and a heavy board on top of the paper. The press applies even pressure to the board and the image is transferred to the paper. To see an interactive illustration, visit the Museum of Modern Art’s website. 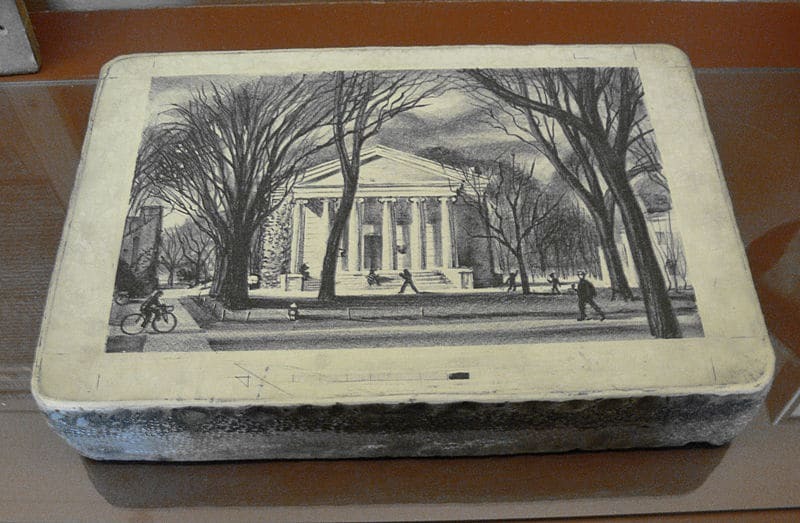 Currier & Ives had in-house artists colorize most of their lithographs, but some were sold uncolored so art students could finish them. 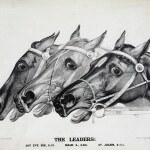 In the print entitled The Leaders, three of the fastest trotting horses of their time are portrayed: Jay Eye See, Maud S, and St. Julien. The colorized version of this print, which can be seen at the Springfield Museums in Springfield, Massachusetts, was produced using a newer technique called chromolithography. This method used multiple lithograph stones with the same image, each one featuring a different color to be printed on the paper. Chromolithography streamlined the production process because prints no longer needed to be hand-colored. 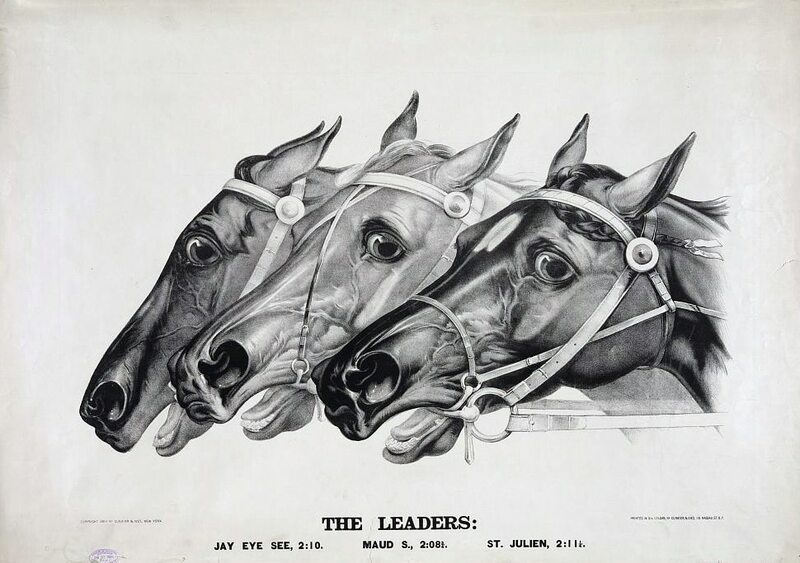 The Standardbred gelding Jay Eye See, featured in The Leaders print, was a grandson of Hambletonian owned by Jerome Case, founder of the Case company that manufactures heavy equipment. The horse was used during his lifetime to promote the Case company, which produced portable steam engines for road construction and farm equipment. Jay Eye See is still the only horse to set world records in both trotting and pacing. There is a street in Racine, Wisconsin, named after Jay Eye See. The Standardbred mare Maud S was a record-breaking granddaughter of Hambletonian. She was one of the first horses that inspired breeders to consider the importance of pedigree when breeding a future race champion. St. Julien, also a grandson of the great Hambletonian, was a Standardbred gelding who pulled a milk wagon until he was discovered and raced for the first time at the age of seven. He set multiple trotting records on both the East and West Coasts. 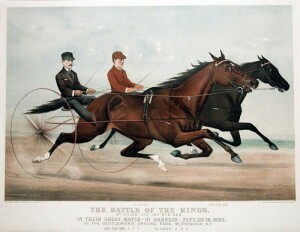 The Battle of the Kings (1884), St. Julien (front) portrayed in a match race with Jay Eye See. Nathaniel Currier retired from the business in 1880 and James Ives continued working for the company until his death in 1895. Over the next dozen years, photography and offset printing began to threaten the Currier & Ives business and James Ives’ son Chauncey liquidated it in 1907. More than 1 million prints were made by the company during its existence. You could start by posting your link on the Currier & Ives official Facebook page and see if anyone there has suggestions. You may need to list the items on the U.S. Ebay site since they were American printmakers. Thanks for your question!